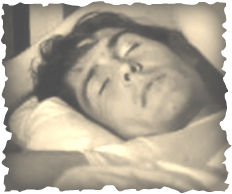 Johnny crawled into the makeshift bed and pulled the covers close. He felt achy and chilled to the bone, maybe from the cold he obviously had, or maybe from the deep regret for all the trouble he had caused. How could his camping out in the alley have brought on so much trouble for these nice people? He lay curled up in the cot thinking over the past couple of days. Those thoughts led his mind back to the boy's facility. Trouble always seemed to find him there and had somehow followed him here. What had he done to bring trouble? He tried to remember, but nothing came to mind. He didn't remember doing anything bad…he never did, not then or now; yet things always turned out bad for him. He turned over and stared at the file cabinet on the wall. Thoughts of losing his parents; then walking into that horrible boy's detention center and the foster homes he fought to escape from drifted through his memories. Then when he thought trouble might have finally found a new home…trouble struck again when his uncle died. Silent tears trickled from his eyes, sliding down and dampening the pillow. The deep sadness he lived with daily tightened its grip on his heart, and he slipped into a fitful sleep. Jimbo didn't mean to drop the cookie sheet. The tray clattered against the prep table and bounced on the floor sending loud noises echoing across the room. The normal sounds of a busy diner silenced for a few seconds before chuckles could be heard from the patrons at the clumsiness of the kitchen help. Then the clinking of silverware against glass plates began again. But in the seconds of silence, Jimbo heard a yelp and more clattering and scraping from his office. He hurried over and opened the door. The light from the kitchen shown on the over turned cot and across to Johnny's huddled form in the far corner between the wall and the file cabinet. Jimbo bent down and righted the cot. Careful to move slowly and speak softly he stepped toward Johnny. "Sorry about that, Johnny. I didn't mean to scare you. I dropped a tray." There was no sound from the corner. He couldn't tell if Johnny was holding his breath or not. He continued over and extended his hand. "Come on." Johnny looked up from beneath his bangs, and tentatively reached for Jimbo's hand so he could help him up. He realized that he did trust the man, and that felt good. "Sorry." He mumbled. "For what? If I hadn't known what that noise was, after the day we've had, I would have been startled too." "Acted like a baby." Johnny said softly. "Listen kid, you acted more bravely than some of the officers on the force when you protected Rita earlier." He tapped Johnny's chest. "That kind of courage comes from here." Then he tapped Johnny's head. "Fear comes from here, and you can learn to control that. Being startled after a loud noise…well, that can happen to anyone." Jimbo shrugged. "Someday I'll tell you about being scared after some pretty hairy situations while I was on the force, but right now I think you might want to eat something. I have to get back to the kitchen." "It's okay…I'm not really hungry." Jimbo reached for Johnny's forehead, but he ducked away. Jimbo backed up and held his hands out in surrender. "Okay, either you're really getting sick or you're worried about payment for the food." Johnny's mouth fell open and his eyes got big. "You know I was a teenager once. " Jimbo chuckled. "I don't remember ever not being hungry, and as to payment…I have two sinks packed full of dirty pots, pans and dishes waiting for you after you eat. So, either you eat now or after you finish washing, but you will eat. You need to keep up your strength so your body can heal. You choose…before or after." Jimbo turned toward the kitchen. "Oh yeah…Rita has a huge slice of fresh apple pie with your name on it waiting beside the biggest ham sandwich I've ever seen." He laughed as he walked out of the room. "A big slice!" Jimbo teased. "Well…maybe I will eat a little." His stomach growled. His eyes met Jimbo's and he shrugged. Jimbo's smile grew. "But then I'll get right on those dishes." Rita saw the exchange through the window between the kitchen and the dining area. She held her breath, hoping Johnny would agree to the "job" Jimbo had planned for him. It was the first step towards them being allowed to continue helping him after today. When Johnny agreed she let the air out in a whoosh and couldn't help the smile that stretched across her face. She also couldn't stop the tears of relief and joy the involuntarily slipped from her eyes. She turned from the window just in time to avoid meeting Johnny's eyes. "Yes, may I help you?" On the other side of the counter stood a very tall, slender man who could have passed for Abe Lincoln. He wore a fireman's uniform. "I was on the crew that responded to a fire here last night." "Oh…thank you for getting the fire out!" He splayed his hand on his chest. "We didn't. I mean we made sure it was out, but there was a kid here that did most of it. I wanted to check on him to see if he was alright. We…uh…he…um...I can't believe he knew what to do! He'd make a hell of a…sorry…a great fireman. Rita smiled. Pride swelled at the things the man said about Johnny. "Well it just so happens, Captain…"
"I'm no Captain…" He blushed. "Engineer…I'm the engineer. I just drive the rig and operate the pumps. I'm not the Captain." "Really? You look like a Captain. Anyway…um Mr. Engineer, I'm Rita. The kid is doing okay. As a matter of fact he's right here in the kitchen. I'll get Johnny for you." Hank held up his hand. "No, that's okay…I just wanted to make sure. He looked like he might have been hurt. My name is Hank…Uh…Henry." He smiled at her. "He was mugged in the alley the night before the fire. In fact we had never seen him before Jimbo found him out there in the alley, soaking wet and hurt. It was the kids that mugged him that started the fire." "I guess they were angry that Jimbo was trying to help Johnny. We are still trying to figure that out. But, they are in custody now, so maybe we'll get some answers." "Good. I'm glad. We need to get arsonists off the streets. If there is anything the fire department can do to help the charges stick…"
"Well actually it was the break in and hostage situation they were arrested for. Oh and the gun." Hank's eyes got big. "Hostage situation…gun?" Rita giggled. It was easy to joke about now that the thugs were in custody. Maybe it was a healing reflex. "Yep…Hostage situation. The three of us, Jimbo, Johnny and me were held at gunpoint this morning by the same thugs that hurt Johnny and tried to burn this place down." "Wow!" Hank declared as he scratched the back of his head. "Then why are you open?" Rita thought about that very question for a second. Then she answered. "Well, we can't let horrible people like that shut us down or stop us from living…can we?" She didn't know if she was trying to convince Hank or herself. "Besides that boy…young man in there needs to see that he has to go on. I think maybe he already has, but he has to face whatever life throws at him. We can't shy away from adversity. We can't hide from violence. It is everywhere…all around us." "Yes it is. I'm glad Johnny has people he can look up to. You said he was mugged? Where does he live? Where is his family?" "We aren't sure, but we think he may be a runaway. His driver's license is local, but he begged us not to call anyone; begged not to go to the hospital. He even threatened to leave even though he could barely stand" Rita smiled at Johnny's strength of character. "He's sleeping on a cot in the office for now. After that…I don't know." Rita didn't know why he felt so comfortable sharing all of this with Hank, but he seemed to bring out a trusting calmness in her. He was an excellent listener, and she needed to talk about everything that had happened. "Excuse me just a minute." She went to fill coffee cups for several tables and see if anyone needed anything. Hank glanced into the kitchen and watched as Johnny started on a huge stack of dirty dishes. "Can I get you some coffee or something?" Rita asked as she slipped back behind the counter and returned the coffee carafe to the burner. "No thank you. My fiancée is waiting in the car. I have to be going. I'm glad the kid…uh, Johnny, is doing okay." He reached into his pocket and pulled out a brochure. "Would you please give this to Johnny? It's information about the LA County Fire Department training academy. What the qualifications are and how to apply." Hank shrugged. "We all thought he was a natural." "Sure, I'd be glad to." Rita took the flyer. "Nice to meet you, Henry." Hank stood to leave, pulling his well worn fire department baseball cap from his back pocket, started to put it on and stopped. He looked at the cap…turned it this way and that; then he smiled. "Give him this too." Rita watched the lanky man as he exited the diner running his hand through his hair as though he were worried about how it looked without his ball cap. She smiled. Johnny pushed through the swinging kitchen door with a load of clean coffee cups. "Let me help you." Rita laid the cap and brochure on the counter. Johnny turned slightly, "I've got it. Where do they go?" Rita had to stop herself from giggling. Johnny was so independent. She stepped forward to direct him. "The glasses go there and the plates under the counter, these get stacked beside the coffee maker." Johnny stepped over to the counter space beside the coffee maker and hoisted the cup trays up and over the edge. Then he turned and disappeared through the door only to return again with the glasses. Rita leaned against the counter and watched him make two more trips. When he came through the door one last time she was waiting for him with a tall glass of soda. Johnny turned it up and drained the glass, "Thanks," he said as he wiped his mouth on the back of his hand. "Here let me get you some more." She reached for the glass. Johnny smiled. He was thirsty. "Try slowing down a bit though. You don't want to be sick." She smiled. Johnny blushed. When she turned back to her task of wiping the counter tops she noticed the cap and brochure, "Oh I almost forgot a fireman brought you this for you." Johnny looked at her with a trace of alarm. "A… a f… fireman?" he stuttered. "Why?" "Well, he said he and his friends that came to put out the fire thought you were a natural." "A natural?" Johnny couldn't believe what he was hearing. "Yes, sweetie, that's what he said." She again reached out with the hat. "Take it… it's yours." Johnny slowly reached out and took the cap. "He left this brochure for you too. He thought you might want to look into the fire academy." They were so involved in their conversation that neither Johnny nor Rita noticed Jimbo had come to stand at the kitchen doors and was watching them. Johnny looked up at her with sadness. "I already tried. They wouldn't take me. They said I was too young. I told them my aunt would say it was okay, but they just said no." He looked back at the cap, ran his fingers across the bill. He turned it this way and that admiring the letters on the front, and the way the bill was curled just so. It was an old cap, well worn, but it was clear it had meant a lot to the man who wore it. Rita leaned in closer he was speaking so softly she almost couldn't hear him. She watched as he admired the ball cap. He held it so carefully, like a prized treasure. "Sweetie," she put her hand on his shoulder and pulled him close, wrapping her arms around him, "they said you were too young then. Let me see that brochure." She took it back and opened it, reading it quickly. "It says here you have to be eighteen. Won't you turn eighteen on your next birthday?" Johnny pulled away from her hug and grabbed the tri folded paper. "It does?" He read quickly. "I do!" "Then as soon as you turn eighteen you can sign up." Rita smiled. As quickly as he had become excited, Johnny returned to the saddened boy. "But I need a job now. I don't have anywhere… uh. I need to earn some money. I mean I cut yards and it pays okay, but not enough to get a pl… uh not enough. My birthday is months away." Jimbo slipped back into the kitchen unnoticed. He'd heard enough. "Well then we will just have to find you a better job until your birthday." She ruffled his hair. "Now we have work to do right here." She turned back to the counter and finished cleaning. When she noticed Johnny had gone back to looking at the cap and brochure, she used her apron to wipe away the moisture that had pooled in the corner of her eyes. Johnny ran his finger alone the seams of the cap and once again turned the cap this way and that before placing it on his head. Then he curled the brochure and shoved it in his back pocket. He looked up at Rita. His smile disappeared, and he pulled the cap back off. His aunt had taught him to take off his hat when he was inside. It was rude to wear a hat indoors. "Put it back on Johnny. Someone taught you some manners didn't they? It's okay this time." She winked at him. He returned the cap to his head and a grin spread across his face that reached his eyes and seemed to make them sparkle. With a little more spring in his step he pushed through the kitchen doors to go ask Jimbo what he needed to do next. "Hey kid, I need to run down to the corner grocery. Do you think you feel up to helping Rita until I get back?" Jimbo asked as he made sure the burners on the grill were turned off. "Yes sir. I can do that." Jimbo smiled at the politeness. "Good. I won't be long, and the dinner crowd hasn't started yet, so it should be okay. Just help her make drinks, clean tables. Okay?" "Yes sir." Johnny grabbed a bin to bus the tables with and went back to the dining area. "Rita, I'm going down to the corner grocery. I'll be right back. Can you handle things?" "What do you need at the store? I got everything you had on the list." Rita raised an eyebrow in question. "Uh, I need something… um, something I forgot to put on the list." Jimbo winked at her and leaned his head toward Johnny. Rita smiled, "Ooooh. Okay, we'll hold down the fort. Won't we Johnny?" Johnny glanced up from cleaning a table and nodded. Jimbo wasn't gone long. His first stop at the corner grocery had taken less time than he had thought it would. Convincing Mr. Wong that he needed some help, at least someone to bag groceries and help little old ladies to their cars, was easier than he thought it would be. Telling him he had the perfect candidate for the job and that Johnny wouldn't take it as a handout took a bit more explaining. He would call Mr. Wong in the morning after he asked Johnny to run down to the store so he could put the Help Wanted sign in the window in time for him to see it. Hopefully Johnny would take the bait and ask about the job. His next stop was at the apartments down the block. They were pretty rundown and the lawn and flower beds in disrepair. Convincing the elderly widow to allow him to sign a lease for a minor took some doing, but after explaining the kid's ability with lawn work and offering to help pay for the plants for the flower beds the deed was done. Now he just had to convince Johnny to go ask the owner if he could rent an apartment. He never had to know it was just a dummy lease. The real one was already taken care of. On the drive back to the diner he formulated a plan. A phone call to Mrs. Sanders after Johnny went to bed put the plan in place. If the kid ever found out what he'd done he probably would walk away from the whole deal, so Jimbo would have to make sure he never found out. "Did you get everything you needed?" Rita asked him as he came through the back door seeing he had no bags in his hands. "Huh?" he looked up with a confused expression. "Oh…uh yeah." He smiled and winked at her. "Where's Johnny?" Jimbo's eyes widened. "The bathrooms? I only asked him to help with the dishes." "Well he did that already. We haven't been busy. That boy can't stand still for long. I turned my back for a minute; when I turned around he had a mop and bucket and disappeared into the bathrooms." Rita giggled. "He's really something." "Yeah he is. He's not like most the seventeen year olds I've met; especially the ones on the street." "Listen Boss, I gotta go. The boys are expecting me. I'll see you tomorrow." Rita untied her apron and hung it on the wall hook. "I'll just go tell Johnny goodbye." Another night on the cot left Jimbo sore and his bad knee aching. The other cot was empty when he awoke. Noises in the kitchen drew him, albeit slowly, from his makeshift bed to see what Johnny was up to. When he limped through the door he was surprised to find Johnny at the prep table slicing onions and tomatoes. "What're you doing kid?" Johnny's eyes shot up in alarm. "I… um, I just thought." He laid down the knife. "I just wanted to help." "Well don't stop on my account. Looks like you have everything under control. I'll give you a hand as soon as I start some coffee." "It's already made. Do you want me to get you a cup?" Johnny bounced on the balls of his feet like he was preparing for a race. Jimbo scratched his head. "Already made?" "I used to make it for my aunt before going for my morning run when I was on the track team at school. She loved waking up to fresh coffee without having to make it." Johnny smiled, but it faded quickly. He missed his aunt. He thought he would go see her after his black eye healed. "I'll get you a cup. Do you want anything in it? Cream, sugar or both?" Johnny never knew his aunt always made a fresh pot while he was running. He always made it too strong and sometimes it had grounds in it. Poor kid just wanted to please her, but his coffee was terrible. It was no wonder he always said he preferred milk. If he had ever tried his own coffee he would never want to drink the stuff. "Black." Jimbo eased into a chair and rubbed his knee. Johnny hurried to get the coffee. "When I used to run track the coach always said to ice swelling. You want me to make you an ice pack?" "It's an old injury; bothers me sometimes when I don't exercise it enough." "I kept you from the gym, didn't I?" Johnny looked at his shoes. All of the energy he had a few seconds ago seeped away. "I'm sorry." Jimbo sighed. Keeping up with Johnny's emotions was like a roller coaster ride. One minute he was up and the next unsure of himself again. "What are you talkin' about? You didn't do anything wrong. Those other kids, yes they did a lot wrong. If anyone is to blame for my knee giving me fits, it's them; not you. Understand?" He reached for his coffee. "Now get back to that prep work and let me have some of this coffee. I'm much easier to get along with after a couple of cups." He sipped and nearly gagged. Not wanting to let on how terrible the coffee tasted he claimed it was hot. "Whoo that's hot. I think I'll just let it cool a little." He sat the offending brew on the work table. "Say Johnny, do you think you could run down to the corner grocery? Mr. Wong is supposed to have a bag of potatoes for me this morning. He was expecting a delivery. We'll need them for dinner tonight." "Sure I can do that. I'll be right back." Johnny bolted for the door only to stop just before going out. "Um, where is it?" Jimbo couldn't help but laugh. "It's just down the block on the corner. It's called Wong's Corner Grocery. You can't miss it. Just take a left out of the alley." Johnny flew out of the door. Jimbo pulled himself up out of the chair and over to the phone. If he didn't hurry Johnny would be at the store before Mr. Wong had a chance to put the sign up. Then he had to make a fresh pot of coffee before Johnny knew he didn't like the first pot. He would have to teach the kid how to do it right. Johnny jogged to the end of the alley and looked left and right before turning to the left. It felt funny to be outside after being cooped up for two days. It felt good. He thought if Jimbo didn't need him this afternoon he felt good enough to get back to his lawn jobs. Remembering Jimbo's knee left him thinking as he jogged that maybe he should return to the shelter tonight; get out of the way. Before he could dwell on it he was at the store. When he reached for the handle to go in he noticed a "Help Wanted" sign in the window; a smile broke out on his young face. "Hi, my name is Johnny. Jimbo sent me down to pick up a bag of potatoes." Mr. Wong smiled at him. "Okay, you wait here. I'll just get it from the back." "Do you need any help?" Johnny asked honestly. "No you wait here. I'll be right back." Johnny bounced on the balls of his feet again. He paced back and forth down the length of the counter. It seemed to take Mr. Wong forever to come back with the potatoes. While he waited he decided to look around some, size the place up. There were only a couple of other customers in the store leaving Johnny to wonder why they needed help. One was a young woman with a baby and the other an elderly woman who seemed to be having trouble reaching some flour on the top shelf. "Excuse me ma'am, can I help you with that?" He stepped up and waited for the okay. The woman smiled and nodded her head. "Yes please." Johnny easily pulled down the bag of flour. "Do you need just the one?" "Yes, just the one. What's your name boy?" Mrs. Sanders asked. "John, but my friends call me Johnny." He smiled crookedly. "What happened to your eye?" She asked sympathetically. "I got mugged. It was really stupid of me. I was in the wrong place at the wrong time." He absently rubbed his eye as he spoke. "Don't rub it," Mrs. Sanders reached for his hand to stop him from rubbing his eye. "It'll take longer to heal if you keep rubbing it. Try to leave it alone." She smiled. "Yes ma'am, I'll try. Well I better get back up front. I'm here on an errand for my friend. Have a nice day." He turned and disappeared around the row of shelves before she had a chance to say anything. Realizing Jimbo had been right about this kid, she started toward the checkout hoping to catch him before he left. "Here you go." Mr. Wong handed the heavy bag of potatoes to Johnny who struggled to pick it up. "Can you make it all the way to Jimbo's with it? It's kind of heavy for a skinny boy like you." Johnny sat the bag on the counter. "Can I ask you about the sign?" "Sign?" Mr. Wong had almost forgotten his agreement with Jimbo. "Oh yes would you like to apply?" "Bagging groceries, helping people out to their cars with their purchases, cleaning, stocking shelves." "I could do that. Can I apply?" Johnny was getting excited; it showed in his eyes. Mr. Wong had already agreed with Jimbo to hire the boy, but after meeting him he knew it was the right thing to do. He reached beneath the counter and pulled out an application. "Do you live nearby?" Mr. Wong could see the immediate change in the boy's eyes. Sadness slipped in. "I can get here. I'll be on time. I promise." "Fill this out and bring it back. Right now I think Jimbo needs those potatoes." "Thank you Mr. Wong." Johnny hoisted the potatoes with a grunt. He was still sore from the attack, but he was determined to show Mr. Wong that he was up for the task. "Excuse me, Johnny," Mrs. Sanders interrupted. "Could I give you a lift somewhere? I could use some help carrying my groceries into my apartment just down the street. You see I hurt my shoulder the other day trying to trim some hedges and lifting is hard. Then I could give you a ride where ever you need to take that big bag of potatoes." Mr. Wong had a hard time hiding his smile. Jimbo would be proud of the neighbors for the way they had worked all this out to get Johnny down to the apartments without finding out it was all pre-arranged. "Sure, I guess that would be okay. I mean, you said just up the street. If we hurry, I think Jimbo wouldn't mind." Johnny sat the bag of potatoes into Mrs. Sanders cart and helped her out to her car. "Do you want them in the trunk?" "Yes please. Let me give you something for helping me." Mrs. Sanders tried to slip some money into Johnny's hand. "No thank you. I didn't do it for money." He reached for the potatoes. "Maybe I should just walk back." "I'm sorry son. I didn't mean to insult you. I tip all baggers at the stores where they help me out with my bags. It's okay to take tips." She tried to give it to him again. "But I'm not a bagger here. I haven't even applied yet." "Oh Mr. Wong will hire you. You're a nice boy." She put the money back in her change purse. "I hope so. I really need the job." Johnny closed the trunk and walked around to the driver's door to open it for Mrs. Sanders; then he jogged around to the passenger side and climbed in. A few minutes later they pulled up in front of a run-down apartment complex with overgrown flower beds and high grass. "Mrs. Sanders, I could cut this grass for you, and help with your flower beds. I'm really good at it." "Where do you live, Johnny? Would it be too far for you to come?" "Well, if I'm working for Mr. Wong it won't be that far away. I would just have to do it when he doesn't need me…if I get the job." Johnny shrugged. "You didn't answer my question." Mrs. Sanders crossed her arms and waited. "Where are you living?" Johnny lowered his eyes to his shoes. He didn't like to lie. It was almost as though he couldn't do it. The few times he had made him feel so bad that it almost made him sick. He raised his gaze back to Mrs. Sanders and told her the truth. "I've been staying at a shelter." "Well let's get these groceries inside and have a little chat over some lemonade." She opened the trunk and reached for a small bag of vegetables. Johnny grabbed the other bags and followed her to her apartment. "You see I own this building. My husband died a few years back, and I'm here all alone to run things. As you can see there is a lot to be done. I have several men who live here, but none that offer to help me. People are so busy these days. It just so happens I have an empty apartment on the second floor, just above mine. If you helped with the lawn, flower beds and some odd jobs, I could rent it to you for a lot less than I would normally ask." "You could?" Johnny couldn't believe he ears. "But…but I'm only seventeen." "Well I own this place, so if I want to rent to a seventeen year old then I guess there is no one here to stop me is there?" She smiled and patted his cheek. "So what do you say?" Johnny's eyes widened and the crooked grin she had seen earlier at the grocery store returned. "What do I say? Yes! Yes! I say yes!" He grabbed Mrs. Sanders in a hug. "Thank you! You have no idea. This is great!" His words spilled out in rapid fire. "Can I see it? When can I move in? Can I sign the lease? How much will it cost?" "Slow down," Mrs. Sanders said a bit winded. "I thought you wanted some lemonade." "Lemonade?" Johnny asked. "Can we just see the apartment? I'm sure Jimbo is wondering where I am. After the mugging, and fire, I'm sure he's worried I've gotten myself into more trouble." "Nonsense, if he didn't trust you he wouldn't have sent you on an errand now would he?" Mrs. Sanders reached into her pocket and pulled out a set of keys. "Now let's see. I think it's this one." She moved toward the door. "Well are you coming?" "Yes ma'am!" Johnny was hot on her heels. Mrs. Sanders handed him the keys, "Why don't you open her up. She's yours after all." Johnny's eyes sparkled as he slipped the key into the lock. A place of his own and maybe a new job, things certainly had turned for the better. He opened the door and stood staring into the empty room. "Well, go on in." Mrs. Sanders gave him a gentle nudge and reached passed him to flip on the light switch. "It's small, but I think you will like it." Johnny stepped into the room and looked across to the small kitchen. There was a stove and refrigerator. Then he turned to the hall and walked to the bedroom passing the small bath on the way. "It's perfect! I don't have any furniture, but my sleeping bag will be fine for now. Can I sign the lease now?" "Don't you want to get that job first?" Mrs. Sanders asked knowing full well the first month's rent had already been paid. "Oh, I have a little savings. I can pay a deposit. I can pay the rent." He stopped in his tracks. "What is the rent?" "Well, I don't really know what to charge you yet. I tell you what. Why don't I just give you the keys, you look over the yard and flower beds and come up with a price on that; then we can work out a deal. Okay?" She smiled. If he kept up the yard and helped with some minor repairs she might even let him live there for free, but then she remembered Jimbo said Johnny didn't take well to charity. "I'm sure we can come to an amicable agreement." "Okay, if you're sure." Johnny rubbed his thumb on the keys in his hand. "When can I move in?" Mrs. Sanders had to laugh. "I thought you didn't have any furniture." Johnny laughed too. "Yeah, but I got a sleeping bag and a locker at the bus station full of clothes that would be a lot neater hanging in a closet." "Whenever you're ready. Now if you like, but hadn't we better get those potatoes down to Jimbo's?" She could have kicked herself. Johnny hadn't said the potatoes were for Jimbo. "How did you know they were for Jimbo?" He asked in a voice laced with suspicion. She covered quickly, "Well his is the only diner for blocks. Who else would need that big of a bag of potatoes." "Oh yeah." Johnny shrugged. "I guess we better go." He turned out the lights, closed the door and turned to hand the keys back to Mrs. Sanders. "No, those are yours now." She smiled and pushed his hand away. "I have another set I keep." Johnny stopped and looked back at the door. "What about the utilities. I'll have to have them in my name, but I'm not old enough." "How about until you're eighteen I will just keep them in my name? You can pay me when you pay the rent." She patted him on the shoulder. "I know this is a big step for such a young man, but I think things will work out nicely for both of us. It's been a long time since I had a tenant that I knew would help me when I need it. I think it would be nice if you joined me for dinner on occasion too. I love to cook and most of the time, have more than enough. I get tired of eating the same thing night after night, and my freezer is only so big. In answer to that comment Johnny's stomach growled, and they both laughed. "Let's get you back to that diner. I think I may have to get something to eat myself." Mrs. Sanders led the way to her car. "Thank you." Johnny said sincerely as he pulled the bag of potatoes from her trunk. "I guess I'll bring my things tonight if that's okay. I mean we haven't signed the lease or anything yet." "Don't worry about that. We'll have plenty of time for that over dinner tomorrow night." She smiled. "Okay?" Johnny smiled and hoisted the bag of potatoes as if it were feather light. "Okay. Good bye Mrs. Sanders." He turned and disappeared into the diner. "Well here you are." Rita teased. "Jimbo's been pacing like an expectant father. What took you so long?" Jimbo had filled Rita in on his plan and after seeing Mrs. Sanders drop Johnny off at the door she suspected things had worked out beautifully. "Hey Jimbo!" Johnny called as he burst through the kitchen door. "You won't believe what happened!" Jimbo schooled his face and turned to face Johnny. "What now?" He reached for the potatoes. "Are you hurt?" "What? No! I got a job; well I think I may have a job at Mr. Wong's, bagging groceries. I mean I have to apply, but he seemed to like me. And there was this lady there, Mrs. Sanders; she owns an apartment building down the street. She's lonely since her husband died a few years ago. Man you should see her lawn, and those flower beds. My work is really going to be cut out for me on those. Anyway, she wants me to rent an apartment! Can you believe it? A job…well maybe a job, but a place of my own to live in, and she didn't even care that I'm not eighteen. She said it was her building and there was no one to tell her she couldn't rent it to me." He turned around and took a few steps before turning back around. "She's even going to help me with the electric since I can't get them myself yet. Can you believe it? I mean yesterday and the day before things were a mess, and now." He stopped talking, ran his fingers through his hair and looked at Jimbo. "I didn't even stop to think. Maybe you need me to work here until I pay you back for all the food. I'll just tell her I can't move in. Mr. Wong can find someone else. I'm sorry, I wasn't thinking." His shoulders sagged. "What, wait, slow down, a job, an apartment! That's great! And remember we agreed that you would let me help you no strings attached. That's what friends do…remember." "You mean you're not mad?" Johnny smiled. "Why would I be mad?" Jimbo pulled Johnny into a shoulder hug. "This calls for a real celebration. How does a steak sound?" Johnny's stomach growled in answer. "Didn't you eat something this morning?" "Kid you gotta eat." Jimbo reached for a round of hamburger and patted it flat. "I'll have this ready in a few minutes. Rita, get the kid some milk!" "I can get it." Johnny started, but before he could finish Rita was beside him with a tall glass of milk and three cookies. "Thanks," he said as he bit off of one. "Congratulations on your job and apartment." Rita said. "I heard you telling Jimbo." She pulled him into a hug and kissed the top of his head. She didn't think she'd ever met a more deserving young man. "We'll miss you around here though." "I'll be around." Johnny promised. "Okay kid, here's your burger. Eat up, and then we have some planning to do. If you're going to have a place of your own you'll need some furniture, a bed and stuff." "All I need is my sleeping bag. I'll get the rest when I can. If it's okay with you I'll run over to the bus station to get my things from my locker there. I told Mrs. Sanders I was movin' in tonight." He smiled around a large bite of burger.